A great leader can pull an organization or team through a crisis, but that takes great effort and draws significant resources away from other important strategies and tasks. 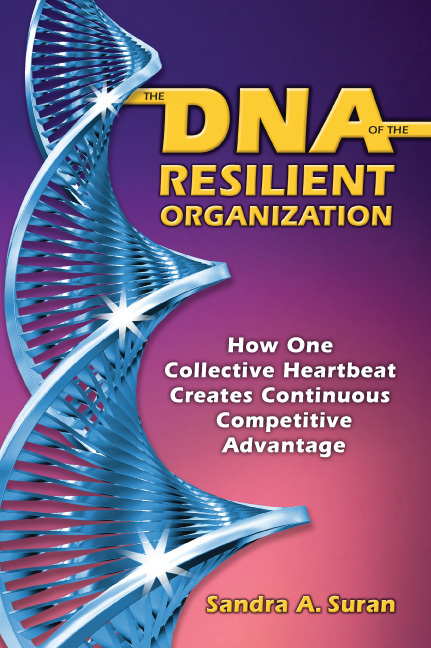 The DNA of the Resilient Organization shows how to makes organizations crisis-proof, to achieve their vision despite obstacles. It shows organizations how to create a collective heartbeat, to become internally stronger and more resilient, so they can meet challenges and seize opportunities as they arise. Each time the organization overcomes a challenge, the processes and tools for resilience become more firmly embedded in its DNA, so the process is self-sustaining. Website content copyright The Suran Group. All rights reserved.